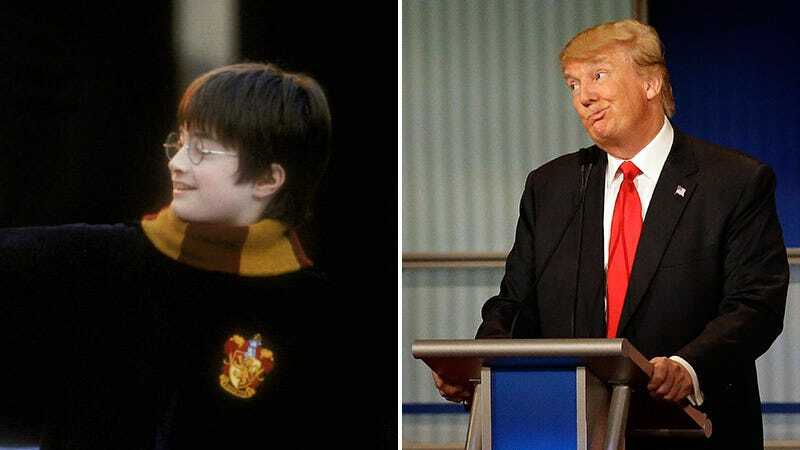 What do Harry Potter universe and Donald Trump have in common—besides Voldemort I mean? Not much, but a study out of the University of Pennsylvania suggests that one may be used as a sort of protection spell against the other. Professor Diana Mutz, a professor of political science at the Annenberg School for Communication, led the study, actually titled “Harry Potter and the Deathly Donald?” She surveyed 1,142 Americans in 2014 and in 2016 (before Trump’s campaign and after) on their attitudes towards torture, the death penalty, the treatment of Muslims and gays. In the latter study, she asked them about their Trump opinions. Mutz found that on a scale of 0-100, the more Harry Potter that was consumed by the individual, the lower their opinion was of Trump, sometimes by 2-3 points. We’re not bringing this up because of the study itself. There aren’t any definite conclusions about how the popularity of Harry Potter has changed our thinking, and considering that 450 million copies of books from the series have been sold, this is a very small sample size. The original study in 2014 was done before Trump was a racist Republican politician (when he was just a billionaire dirtbag instead), so comparisons aren’t available. There are many other factors to take into account, and Mutz acknowledges this. But rather, what’s important to note is what the study represents. Mutz is one of the few people who have thought about researching the impact of fiction on our culture. People have been speculating about the impact of certain pieces of media, like video games, on possible violent tendencies for decades, for instance, but most studies have been done in laboratories. Mutz’s claims to be one of the first to use observational data and real world experiences to document a cultural phenomenon. Mutz did find some other correlations in the ways that age, education, political leanings, and gender impact a person’s tolerance. According to her figures, age and conservative ideology predict negative attitudes towards Muslims and people in the LGBTQ community, while education had a positive effect. Women were also more likely to be more tolerant. While J.K. Rowling may have some issues when it comes to representation of Muslims, gay people, and people of color in her book, along with some questionable choices in the post-Potterverse, there’s no denying that Harry Potter had a huge impact on our culture. And depending on your interpretation of it, it did stress certain values concerning tolerance and acceptance, as well as working to defeat a fascist and tyrannical evil. Maybe there is something here. “Perhaps most importantly, these findings raise the hope that Harry Potter can stop the Deathly Donald and make America great again in the eyes of the world, just as Harry did by ridding the wizard world of Voldemort,” she wrote.